IRVINE, Calif., May 2, 2018 /PRNewswire/ -- No adventure is too big or too small for Mazda CX-3, Mazda's award-winning subcompact crossover SUV. Mazda CX-3 has exceeded expectations by providing class-above and segment-above features in a package that makes it ideal for cityscapes. Introduced at the 2018 New York International Auto Show, the updated 2019 Mazda CX-3 continues to impress. For the new model year, CX-3 has been retuned and refined to deliver a heightened feeling of elegance, driving performance and efficiency. The 2019 Mazda CX-3 incorporates improved materials, sound insulation, newly available full-leather seating surfaces and a standard electronic parking brake. As a result of adopting the electronic parking brake, CX-3's center console and center armrest have been fully redesigned to accommodate significantly greater storage space. Other updates include fully redesigned front seats and new rear armrest with built-in cupholders. The 2019 CX-3 carries a new front grille design in addition to new tail lights and wheels. For 2019, the entry Mazda CX-3 Sport comes standard with new Direct Tire Pressure Monitoring System and Blind Spot Monitoring with Rear Cross-Traffic Alert, fabric-upholstered seats, power windows, power remote door locks, power mirrors, push-button start, two USB ports, 16-inch alloy wheels, rearview camera and Bluetooth hands-free calling and audio pairing, among a long list of other features. The standard MAZDA CONNECT™ features a 7-inch, full-color display that combines infotainment and diagnostic functions that can be controlled through voice command or the multi-function Commander control knob. Smart City Brake Support continues to be a standard safety feature on all CX-3 models. Mazda CX-3's new Sport i-ACTIVSENSE Package adds Mazda's full suite of safety technologies, including Advanced Smart City Brake Support with Pedestrian Detection, Smart Brake Support, Mazda Radar Cruise Control with Stop & Go function, Lane Departure Warning, High Beam Control, Adaptive Front-lighting System, Active Driving Display, rain-sensing windshield wipers, automatic climate control, automatic on/off LED headlights and LED combination tail lights. The mid-level CX-3 Touring upgrades to 18-inch wheels and adds Mazda Advanced Keyless Entry, heated side mirrors, automatic on/off LED headlights, automatic climate control, rain-sensing wipers and new piano black pillar accents. CX-3 Touring features black leatherette seating surfaces with three-level heating adjustment for the front seats. The driver is also treated to a leather shift knob and steering wheel, while the front passenger seat adds a new manual seat lifter. CX-3 Touring also receives a newly available Touring i-ACTIVSENSE Package. 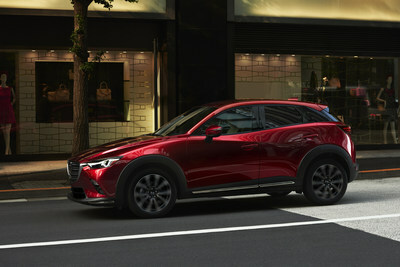 This package adds Mazda Radar Cruise Control with Stop & Go function, Lane Departure Warning, High Beam Control, Adaptive Front-lighting System, Active Driving Display, Advanced Smart City Brake Support with Pedestrian Detection, Smart Brake Support, LED headlights and LED combination tail lights to the CX-3 Touring trim level. Also available is the Touring Preferred Equipment Package with BOSE® 7-speaker premium sound system, power glass moonroof, SiriusXM satellite radio with a 4-month subscription, HD radio and a cargo cover. Finally, the top-level CX-3 Grand Touring builds upon the all the available CX-3 Touring standard and available features and includes Parchment or black full-leather seating surfaces with high-gloss, pleated piping. Chrome accents on the front bumper and side sills, as well as the design of the LED combination taillights, complement its upmarket appeal. CX-3 Grand Touring comes with a full-color Active Driving Display head-up unit, power moonroof, adaptive LED headlights, LED fog lights, LED daytime running lights, Mazda Navigation and paddle shifters. The Grand Touring Premium Package tops off CX-3 with 6-way power driver's seat, power driver's lumbar support, 2-position driver memory system, heated steering wheel, Traffic Sign Recognition and an auto-dimming rearview mirror. All 2019 CX-3 models come equipped with a SKYACTIV-G 2.0-liter engine, paired with a SKYACTIV-DRIVE six-speed automatic transmission with manual-shift and sport modes. The engine has been retuned for refinement and efficiency. For 2019, it is rated to deliver 148 horsepower at 6,000 rpm and 146 lb-ft torque at 2,800 RPM. Front-wheel drive standard; Mazda's predictive i-ACTIV all-wheel drive is available on every trim level. Along with standard G-Vectoring Control vehicle dynamics enhancements, a retuned suspension for both improved and sportier ride, and recalibrated power steering and chassis setups contribute to a smoother, quieter and more enjoyable driving experience. The 2019 Mazda CX-3 arrives at Mazda dealerships nationwide this month. 1 MSRP does not include $975 for destination and handling ($1,020 in Alaska), taxes, title or additional fees. Dealers set actual sale prices. 2 MSRP does not include $975 for destination and handling ($1,020 in Alaska), taxes, title or additional fees. Dealers set actual sale prices.